Discussion in Expired Deals started by illusion • Oct 24, 2013. 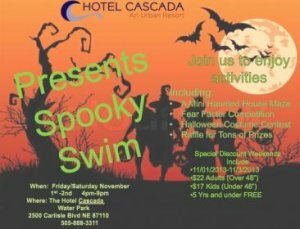 This is a Halloween water park deal for the Albuquerque, NM area at Hotel Cascada. The deal is for 11/01/13 - 11/03/13. Adults Swim pass (over 48'') is $22. Kids Swim pass 6 years or older (under 48'') is $17. They'll also have a Spooky Maze, a Fear Factor competition, a Costume contest, and a Raffle. I've included the flyer as an attachment. Here's a link to the Hotel's Website.